Are you looking for a promotional item that adds up to your campaign? Check out these promotional kids calculators as the solution. By giving away these calculators printed with your logo, you are ensuring a regular spot for your brand over their study tables. Promo4kids.com stocks one of the thoughtful selection of customized calculators and can be used at variety of locations from schools to homes. These calculators are fantastic and students can carry it within their bags. Get ready to sum up your brand impressions with these high quality and best seller kids calculators. Our prices will keep you covered with 100% customer satisfaction guarantee, online design proof, artwork assistance and promotional efforts. Take advantage of our fast shipping and you will receive your order on time. Do you know places where major brand impressions are built? A study table or work table is the correct answer. It is the place where kids sum up their calculations and capture good impressions. We do understand that the most difficult part for any marketer is to capture the attention of their customers. At Promo4kids.com, we offer a thoughtful selection of customized calculators that will easily put your brand name at the forefront of your young customer. Have you ever thought about the expectations of kids from the promotional gifts that you give them? They will definitely accept anything easily and they will usually retain the gifts that they can use. Promotional calculators easily fit into that bill. They can use these calculators for summing up their digits and save time during home tests, class tests or competitive exams (where calculators are allowed). A logo printed calculator will act as a mini billboard carrying your brand logo and it will remain on study tables of students or working tables of teachers. It works at a subtle level to make your brand logo dearer to them. This type of marketing works better because your brand logo becomes available to the customer when they are taking important decisions. 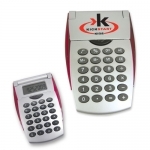 Logo printed calculators can do two tasks at the same time and those are measurement and promotions. Due to its lightweight frame and kid-friendly designs, everyone will happily use these logo printed calculators anytime and anywhere. 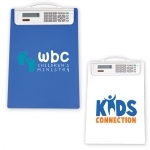 For added benefits, you can always team these calculators with other kid's stationary items at Promo4kids.com. When you are shopping for custom printed calculators at Promo4kids.com or any other desktop item, you can turn to us for more value service and complete assistance from selection to ordering. Why don't you give us a call at 855-454-3786 or write to us at info@promo4kids.com and we will gladly guide you in selecting the right item. We make sure that you will get the best bulk price and we will make sure you choose the best imprint option.